In the previous part 3 , we have seen how ActiveMQ helps distinguish remote consumers from local consumers which helps in determining shorter routes from message producers to consumers. In this part 4, we will look into how to load balance concurrent consumers on remote brokers. Let’s consider a bit more advanced configuration to load balance concurrent message consumers on a queue in remote brokers as shown below. In the above configuration, we have a message producer sending messages into a queue moo.bar on broker-1. Broker-1 establishes network connectors to broker-2 and broker-3. 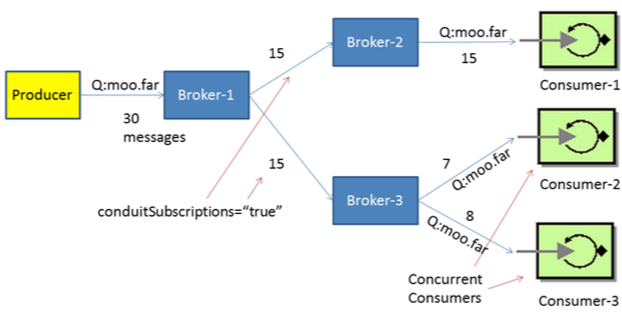 Consumer C1 consumes messages from queue moo.bar on broker-2 while consumers C2 and C3 are concurrent consumers on queue moo.bar on broker-3. Start broker-2, broker-3 and broker-1. We can start these in any order. Let's start the consumers C1 on broker-2 and C2, C3 on broker-3 but on the same queue called "moo.bar"
The consumer subscriptions are forwarded by broker-2 and broker-3 to their neighboring broker-1 which has a network connector established to both broker-2 and broker-3 by the use of advisory messages. Let's review the broker web consoles to see the queues and corresponding consumers. Though there are three consumers (C1 on broker-2 and C2,C3 on broker-3), broker-1 sees only two consumers (representing broker-2 and broker-3). This is because the network connector from broker-1 to broker-2 and to broker-3 by default has a property "conduitSubscriptions" which is true. 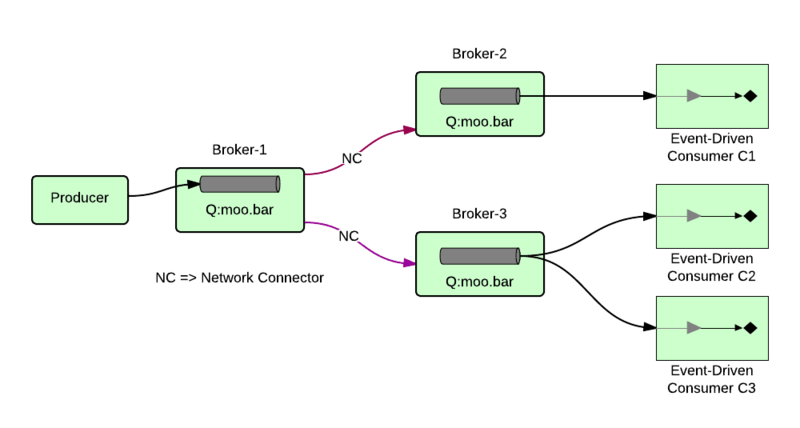 Due to which broker-3's C2 and C3 which consume messages from the same queue "moo.bar" are treated as one consumer in broker-1. As seen above, even though there were three consumers and 30 messages, they didn't get to process 10 messages each as C2, C3 subscriptions were consolidated into one consumer at broker-1. conduitSubscriptions="true" is a useful setting if we were creating subscribers on topics as that would prevent duplicate messages. More on this in part 5. Upon restarting the brokers and consumers C1, C2 and C3 and producing 30 messages into broker-1's moo.bar queue, we find that all of the three consumer subscriptions are visible at broker-1. As a result broker-1 dispatches 10 messages to each of the consumers in a round-robin fashion to load balance. This is depicted pictorially below. Thus in this part 4 of the blog series, we have seen how we can load balance remote concurrent consumers which are consuming messages from a queue. As always, your comments and feedback is appreciated! The configuration files (activemq.xml and jetty.xml) of all the brokers used in this blog are available here. Hi Ashwini. Great Tutorial! thank you a lot for the effort. Pls, I really cant wait for part 6 (How to prevent stuck messages). I have tried several different config parameters but always get messages that are not consumed. Maybe can you give us some pointers here ? Edison, regarding the stuck messages, you may have to look into disabling audit (so duplicate messages are not rejected) and turn on replayWhenNoConsumers flag in conditionalNetworkBridgeFilterFactory. I have used these settings in the past. Your exact use case may be very different. I am writing up a blog about this.